Syria is the most dangerous place in the world to be a civilian. Millions of people urgently need help. What started in 2011 as peaceful protests inspired by the Arab Spring has turned into the world's largest refugee and displaced person crisis, described by the UN as 'the biggest humanitarian emergency of our era'. More than 13 million people inside Syria itself are in dire need of life-saving aid while over four million have fled the country to seek safety in the region. 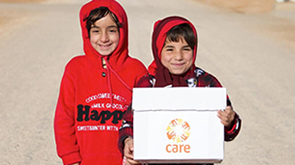 Click here to read the latest stories from CARE’s work to support the Syrian people affected by the crisis. Also check our media releases page for the latest CARE statements and comments on the Syria crisis. We are providing assistance to people inside Syria and to refugee families in neighbouring countries including Jordan, Lebanon and Turkey. We are also providing emergency assistance to refugee families crossing into Europe. We work alongside other international humanitarian organisations, local partner organisations, UN agencies and governments. Well over 3 million Syrians have registered as refugees across the region. It's estimated that the actual number of refugees has reached 4.6 million - meaning more than 1 in 5 Syrians has left the country, 75% of whom are women and children. 13 million people inside Syria are in need of humanitarian assistance as a result of the ongoing conflict. Sexual exploitation and violence has risen dramatically in the region. Many families were forced to flee their homes with little or nothing at all. Significant numbers of refugees are living in crowded camps but three-quarters are in urban or rural areas where, with extremely limited resources, they face rising rent and living costs with no way of supporting their families. This places severe stress on the governments and people of the countries they flee to. In Lebanon, the number of registered refugees has reached one million and amounts to a quarter of the population. The government of Jordan estimates that the country is hosting 1.4 million Syrian refugees - making them one-fifth of the population of the country. In Turkey, more than 2 million Syrians are registered as refugees. Humanitarian organisations are also under pressure to provide food, shelter, health care, education and safety. 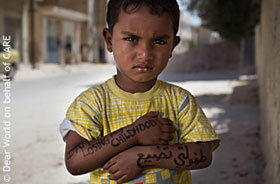 CARE has assisted more than 4 million people affected by the Syria crisis in Syria, Jordan, Lebanon, Turkey, and Egypt. Inside Syria, we've assisted more than 3.4 million conflict-affected people in south, central and northern Syria with livelihoods, food, water, sanitation and hygiene support. In Jordan, we've helped 478,000 people, including Syrian and Iraqi refugees and vulnerable Jordanian host community members, particularly in urban areas. We have supported the construction and the day-to-day running of community centres in Azraq refugee camp. Many refugees also live in crowded conditions in Jordan's towns and cities. We provide livelihoods support to refugee and host communities, and emergency cash assistance for refugees so they can pay for urgent basic needs. Most refugees use this support to pay for rent, medication and food. In Lebanon, we've helped 295,000 people in refugee and host communities, providing hygiene kits and helping refugees access further health, legal and social support; installing water tanks; and working with municipalities to improve water supply and sanitation infrastructure for refugees as well as host communities. In Egypt, we provide psychosocial assistance to women, men and children helping them to cope with their experience of violence, flight and loss of family and friends. We are also raising awareness among the refugees of sexual exploitation and other forms of gender-based violence to protect them from any form of abuse. In Turkey, we’ve helped 93,000 people with food, hygiene and household items, blankets and clothing, and advice and support through our information volunteer programmes. In Serbia and Croatia, we assisted 148,000 people mainly through food packages, hygiene kits, shelter materials and other non-food items (eg blankets, clothes, shoes). In Greece, we helped 5,400 people with food and water, other emergency relief items, protection advice, and information and communications support. Note: figures for people helped outside Syria include Syrian refugees, refugees from other countries including Iraq and Afghanistan, and host communities.